Pixel Mixel is the new full length album by Bitbasic containing 11 tracks of playful and melodic Electronica. On his 40+ minutes album he’s been touching the various styles such as Drill ‘n’ Bass, Nu Breaks and Intelligent Dance Music. Something for the ladies and gentlemen on the dancefloor indeed but also thought to be heard under your headphones! Pixel Mixel arrives right on time for this year’s Cologne Commons festival where Bitbasic will be performing live on Saturday 12th June 2010 at the famous Gebäude 9 in Cologne. With his current release Bitbasic; the lunatic noise enthusiast from London, pushes forward the next level of glitchy Breaks and drilly IDM. London-based Bitbasic aka. Simon Haycock, has released several EPs and albums through other netlabels such as Monotonik and Testpilot Music before; Bitbasic started his musical adventures at the age of 15. 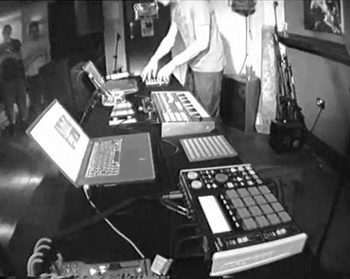 Playing out with a laptop and 40h monome, Simon uses his self-written software ‘dj64’ which modells a mixer and two turntables virtually. Bitbasic has recently played live at the Unique Beats Festival 2010 in Edinburgh as rec72 netlabel mates Pandacetamol did in 2009. This is absolutely fantastic. Very precise, expressive and bold. Listened to it on the train home today – it was the perfect soundtrack. I’m DEFINITELY telling friends about this one. Yet another fantastic release from Bitbasic. Amazing! Kliq’s not lying. He told me about this one. I mean, I already knew about it, but he told me he liked it. 2 Great rec72 electronic releasesIs This A Blog? | Is This A Blog? Hmm – thought you would have had a ping-back on this. I played the track “Fish restaurant” on my podcast: The CerebralMix (http://cerebralrift.org). Complete attribution to the artist and release page have been given in the show credits and/or on my website. another GREAT release (just discovering) … compliments ! cool tracks. thanks for sharing.